Yet another way to dress up meat between bread. Because sometimes sausage likes to be fancy. 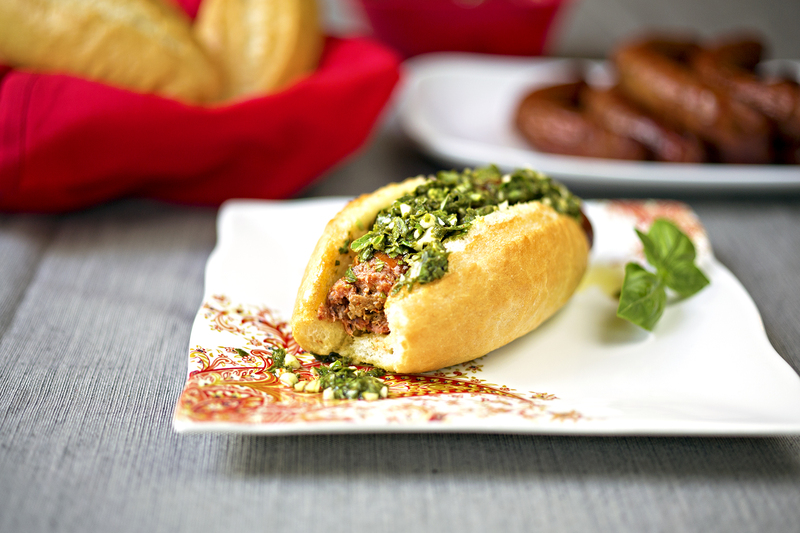 This recipe is inspired by the Argentinian treat, Choripan, chorizo + pan (bread), which is basically chorizo eaten like a hot dog and covered in Chimichurri – yum! I’ve been meaning to make it but of course we are fresh out of chorizo! So, I decided to really switch it up by using Italian sausage and a very deconstructed chimichurri made with basil as the base, instead of parsley and/or oregano. This sauce falls somewhere between chimichurri and pesto. Since we’re combining words today, let’s call it chimichesto! I would like to add that while Italian sausage is not typically synonymous with avocados, if you have some avocados or guac laying around it makes an excellent accompaniment. This recipe is super fast and easy, and perfect for when you’re hosting a grill out because it’s different, delicious, and comes together just so quickly. 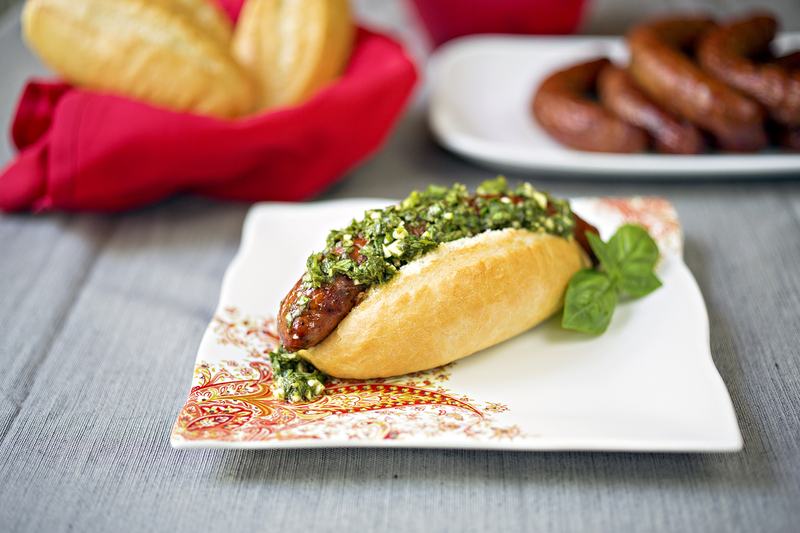 You could even do a few variations of sausages with different chimichurri sauces to match! The best part about this is that if you have leftover sauce, it goes really well with sautéed veggies. Simply sauté your veg, and once cooked take it off the heat and toss with the sauce. Clearly you can use whatever bread you like. The whole thing goes perfectly with baguettes because all the drippy olive oil from the chimichurri just soaks right in. I happened to find some perfectly sized “demi baguettes.” You can also just get a long baguette and slice it to size, but any hot dog-shaped thing will work or even slices of bread if you’re in a pinch or want something decidedly whole wheat. I will say that using a whole baguette (you’ll need two) likely solves the “8 sausages in a pack but only 6 buns” conundrum. Grill the sausages. If not grilling, preheat the oven to 400 and bake until cooked through, about 15 minutes. Meanwhile, chop the basil and garlic and mix with lemon zest, lemon juice, red pepper flakes and olive oil. You want the mixture to be slightly looser than a pesto or a paste. 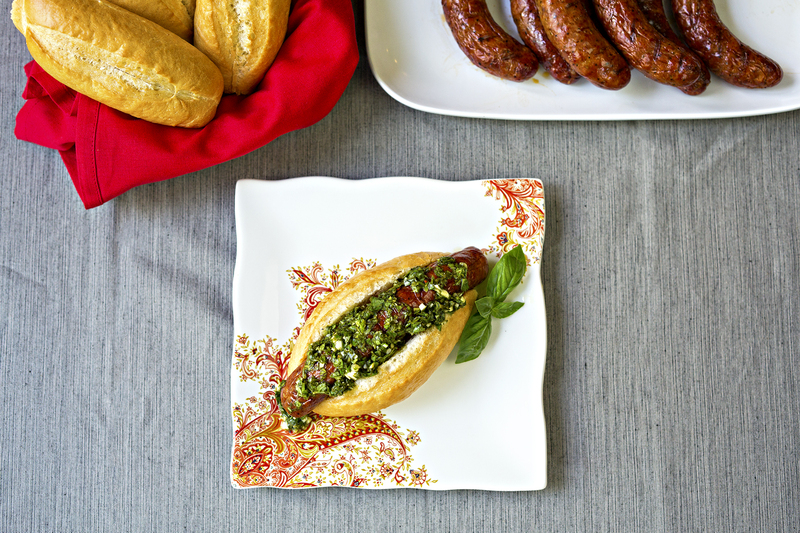 Serve the sausages on a hot dog bun, baguette, bolillo, or other bun of your choice and drizzle with the chimichurri. Non game substitution: Any pork or beef Italian sausage. Works well with sweet, mild or hot depending on your preference.